Many dogs dislike or are fearful of various types of handling for procedures such as toenail trims, injections, and venipuncture. While it may seem faster to use force-restraint, this type of handling frequently makes the patient worse and takes more time. Techniques for training dogs to enjoy procedures are straightforward, but there are important nuances. In this lab, you’ll learn the detailed steps that will lead to quick and efficient success. Your patients will now be happy and your clients will be, too. 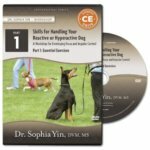 Learn how to train a dog to enjoy toenail trims, injections, muzzles or head collars, and almost any procedure that he previously disliked. Discover how subtle differences in timing, treat placement, choice of motivator, food delivery technique, and the ability to define appropriate criteria can make vast differences in the effectiveness and efficiency of your training. Learn how to increase the likelihood that a dog is motivated for the food that you are using. Discover how you can desensitize and countercondition using motivators other than food. Recognize when you’re performing the techniques correctly, how to avoid common mistakes, and when to make modifications.